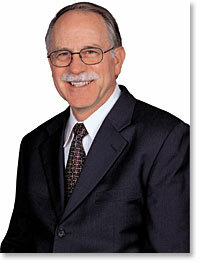 Traditional 3D printing, called stereolithography, was invented in 1984 by Charles Hull. His patented technique utilizes a UV activated liquid polymer which can be hardened under UV light. To create an object, cross-sectional layers of polymer are subsequently hardened one after the other, with printing instructions provided by a 3D computer aided design (CAD). 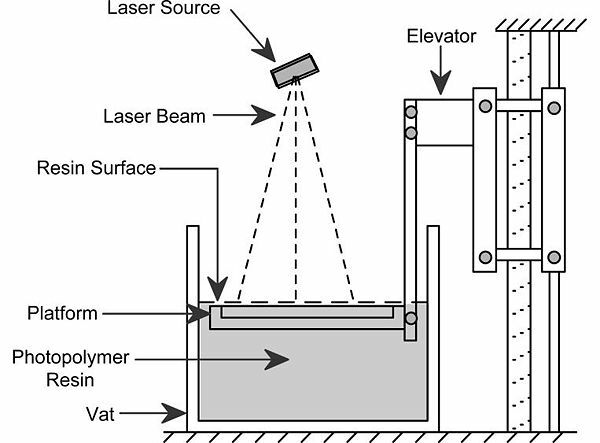 The platform upon which the object is built (see diagram above) is lowered deeper into the liquid polymer after each layer is solidified, allowing for new layers to be constructed on top of old ones, eventually leading to a useful 3D object. Using fugitive ink is one of the most promising ways to create vasculature networks. This type of ink can be sucked up after it is put down, creating empty channels where blood-vessel lining cells can be placed to create working, perfusable vasculature . In their method, four separate ink reservoirs were used, along with four extruders. Different nozzle types were used, including borosilicate and tapered plastic. Air pressure was used to extrude the ink through the nozzle. To produce the full construct, each layer was printed separately (see videos above), after which the vascular network was removed. To do this, the construct was cooled, causing the engineered vascular network to melt--yes, it melts when cooled! The vascular network could then be seeded with a suspension of cells to create true blood vessels . 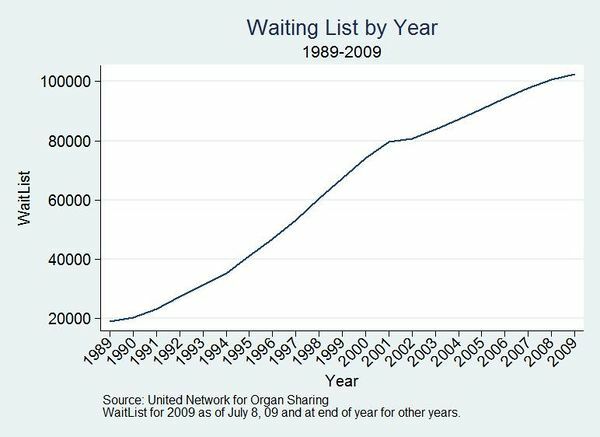 There are not enough organ donors to supply patients in need of transplants, and the waiting list for patients needed organs has only been growing over the years . This has created an incentive for scientists to devise ways to build the organs they need themselves. Perhaps the most promising of these is through 3D printing, which could eventually create a kidney, the most demanded organ for transplant. While scientists are not there yet, a great deal of research has been going into the field. Today 3D printing is quickly becoming one of the more favored tools in the tissue engineer's arsenal, for a variety of reasons. Open-source 3D printers are becoming much more commonplace, allowing researchers to make their own modifications to the original design for their research purposes . Additionally, the applications for 3D printers are rapidly expanding; what started as creating simple objects out of polymers has now matured almost to the point of printing actual organs. While polymers will continue to be useful for bone replacement, such as in the skull , the final goal will be to use the patient's own cells for the transplant. In the area of bone transplantation, some researchers have moved towards 3D printing scaffolds for cells to grow on out of a ceramic base, such as hydroxyapatite, which is then essentially glued together with polymer in the printing process . Still, the process of seeding cells on to scaffolds is not precise enough to create complicated tissues with this method--that is, tissue with multiple intertwined cell types, like what is seen in most organs . Ideally, a method will be created which will allow for an organ to be constructed entirely from 3D printing. Obtaining vasculature in created tissue is one of the greatest challenges facing tissue engineers today. This is because without vasculature, cells on the inside of a tissue are not able to obtain the nutrients they need, and so die quickly . One of the most promising ways to create vasculature in 3D printed organs is through sacrificial molding with fugitive ink (see section How 3D Printing Works - For Tissue Engineering). 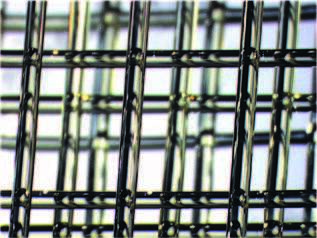 A biocompatible carbohydrate-based glass was used as the fugitive ink for the sacrificial molding. This material is stiff, can quickly dissolve when prompted, and is biocompatible. To create vasculature with this system, the pre-blood-vessel network (shown right) is lowered into a solution of cells suspended in pre-ECM polymer which has yet to be crosslinked. The network was coated with a layer of polymer, poly(D-lactide-co-glycolide) (PDLGA) to force the dissolved carbohydrates to flow through the network after dissolution, rather than through the ECM, which could damage the cells. Their strategy was able to work with a variety of different ECM materials, which is groundbreaking. The team found that their technique was able to correctly seed endothelial and other cells required for creating vasculature (such as 10T1/2 cells), and even showed signs of new smaller vessels forming out of the larger ones. These vessels were able to have nutrients permeate through them, and as a result cells close to the vessels had higher viability than those far away from them, or in a control without blood vessels. Miller believes that this method will provide a highly effective way of vascularizing many different kinds of engineered tissues. Skull reconstruction is a common procedure which can become necessary after severe head trauma or bacterial infection. Other times tumors can invade the skull, or complications can arise post cranial surgery. Traditional methods involve molding a polymer to the skull by hand, usually polymethylmethacrylate (PMMA), which often results in a poor, asymmetrical appearance, or a bad fit. To better serve patients, Stieglitz et al have devised a method of creating artificial skulls using a 3D printer, where the blueprint is reverse-engineered from patient CT scans. PMMA implants, based on computer-designed molds, were implanted into twenty-eight patients--11 female, 17 male--between 2009 and 2012. 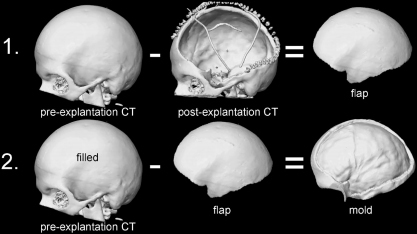 The molding of the implant occurred during surgery, so that a CT scan of the patient's open skull could be used to engineer the necessary shape (see figure right). Results of the procedure were assessed using a questionnaire and quantitative geometric analysis of the implant. Most patients ranked the appearance of the implant to be "good", while two of the twenty-eight found their appearance to be "unfavorable." Overall, most patients said the function of the implant was "good." The quantitative analysis found that the implants had a median quality of 80. This is a cost-effective and safe method of skull reconstruction. Overall results were good, with few complications arising. Hopefully 3D printing will be used to create fully functioning organs, such as kidneys, hearts, and livers, within our lifetime. Radisic, M. et al. Medium perfusion enables engineering of compact and contractile cardiac tissue. Am. J. Physiol. Heart Circ. Physiol. 286, H507-H516 (2004). This page was last edited on 15 April 2016, at 21:03.